Hypoallergenic, Gaiia Vegan Turmeric Neutral Surgras Soap is suitable for sensitive skin and more particularly to skin problems such as acne, eczema and psoriasis. Very used in Ayurvedic medicine, turmeric is a natural antiseptic. Thanks to its anti-inflammatory properties, it prevents bacteria from proliferating and reduces redness. Saponified cold and superfatted, it preserves the moisturizing qualities of glycerine for incredibly soft skin. The Gaiia Vegan Turmeric Neutral Surgras Soap exudes a subtle scent of earth and citrus. J'utilise ce savon au curcuma pour ma peau sensible du visage et je l'utilise sur tout le corps. The Gaiia Vegan Turmeric Neutral Surgras Soap is ideal for sensitive skin problems! 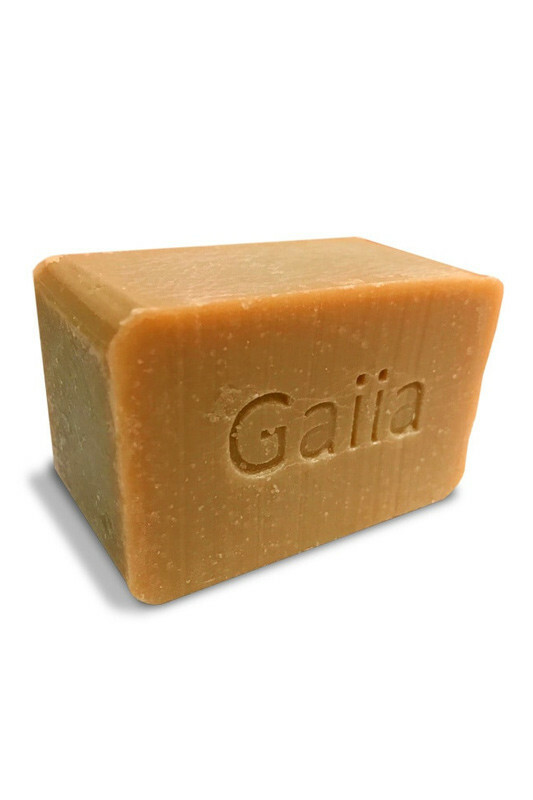 Biodegradable, the cold soap Gaiia respects the environment and the skin! Sodium Olivate, Sodium Rice Branate, Sodium Cocoate, Aqua, Glycerin, Sodium Castorate, Curcuma Longa Root Extract.